Folding L Screen with heavy duty netting. This is extremely portable. fits in the back of a Suburban or any pickup truck. Easy to move and set up. 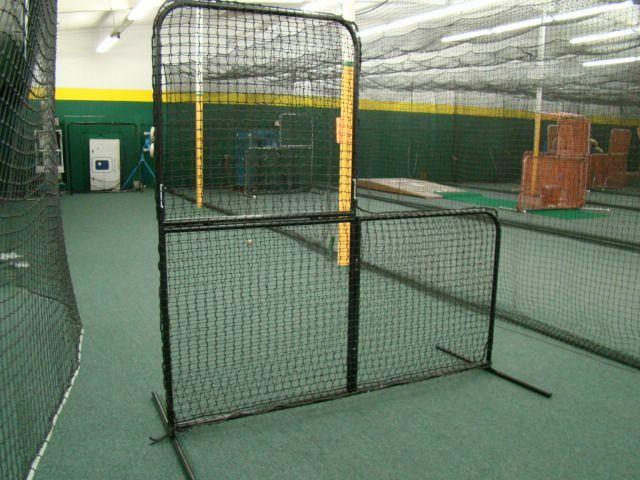 Folding L Frame Pitching Screen New 7' x 7' FOLDING PORTABLE L-SCREEN FRAME and NET. The frame is heavy black powder-coated steel for long life. The double net is a #42 nylon pillowcase style,that simply slips over the frame. Or an # 84 super heavy duty for $25.00 more. This gives you double protection. The L-Screen folds down to a size of 3'6" wide by 3'6" high and fits easily into the back of an SUV, truck or large trunk.